This map by Alex Temes was created in GEO 243: Remote Sensing in Fall of 2016. His map won the April 2017 Illinois GIS Association's student poster competition. Wildfires are both a critical aspect of the cycle of forest succession and a major natural disaster that impact on native species and humans alike. In the case of mega-fires, or fires that burn with the highest intensity, burn uncontrollably, and are massive in size, where does the most damage occur? 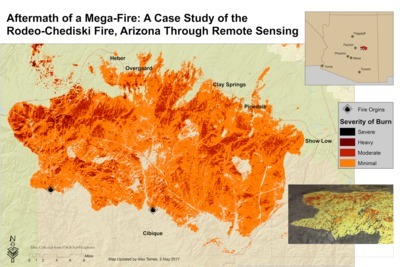 This research sought to investigate the burn pattern of the 2002 Rodeo-Chediski, AZ, mega-fire. Using the technique of change analysis performed utilizing GIS and Remote Sensing methodologies, by subtracting the end image from an image before the fire, a change image was created and classified using ordinal categories. This analysis revealed a pattern of substantial land cover change being located along the physical geographies of increased slopes, with the most visible change occurring at the crest of these geographies. Additional research into fire behavior highlighted the tendency of fire to grow in momentum and tenaciousness as the ground slope of its fuel rises. Therefore it was determined that as the fire climbed hills and other steep physical features in its path, it gained speed. The convection current of the fire allowed for the fire to burn hotter and therefore char the forest more significantly on slope locations than on the surrounding land. In Alex's future research he will draw upon this information and apply it to elevation information for the entire state of Arizona. This will enable the identification of areas with increasingly steeper slopes and, when overlaying that analysis with data regarding highly flammable environments, locations will be identified as areas with increased risk for high-end fire damage.